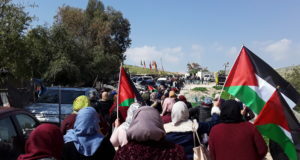 On Saturday 5 February a delegation of activists from the International Solidarity Movement (ISM) went on a tour in the municipality of Tubas, 30 minutes by car to the south east of Nablus. At the municipality building of Tubas we were greeted by Marwan E. Toubassi, governor of the area. We were treated to sweets and coffee while Toubassi told us about the municipality of Tubas. Called the breadbasket of Palestine, Tubas is a municipality about the size of the Gaza strip and includes several smaller villages and the northern parts of the Jordan Valley. 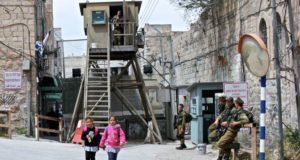 The area is heavily dependent on agriculture, wich has become increasingly difficult as somewhere between 60 and 70 percent of the municipality is under Area C and thus controlled by the Israeli Occupational Forces. Two major illegal checkpoints have been established which further hinder agriculture in the area by restricting the movement of Palestinian farmers. This, in combination with the theft of natural water resources for 10,000 settlers in the region, and the systematic demolition of Palesetinian homes by Israel, create huge problems for the inhabitants of Tubas municipality. Besides the agricultural and mineral resources of the region, the Jordan Valley has always played an important strategic role for the Israeli military. Here is the border crossing of King Hussein bridge, the only way out of Palestine for most Palestinians. Large parts of the area are used for military training and the soldiers often leave behind explosive materials that injure and kill villagers and livestock. is one of the 50 people who have been injured by the military in the small village of Al-Aqaba in the Tubas municipality. In the village, consisting of 300 inhabitants and situated entirely in Area C, 13 people have been killed since the occupation started in 1967. Today Sadiq is a part of the village council and is constantly working to stop the demolition of homes and roads in Al-Aqaba. 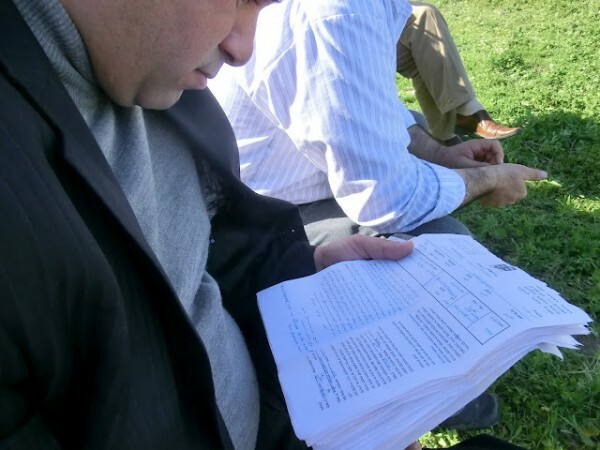 It is no longer possible to get permits to build new homes or even a mosque in the village. A house is currently being built next to the municipality building in spite of the military ban, and during the last two weeks 20 households have been served with demolition orders by the Israeli military. Over 700 inhabitants have left the village in recent years due to the lack of housing. ISM volunteers met with the Bedouins of El-Hamma and heard the story of how their homes were torn down when the area was occupied in 1967. Their homes where temporarily replaced in 1968 but then these structures were torn down as well. Today only two houses still stand from the time. Tents have received notices of demolition. 19 of 22 households in the village currently have demolition orders. 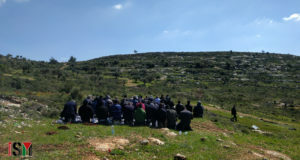 “This is not Israeli land,” said one of the farmers as we volunteers sat under the tallest tree in the village, sipping thyme tea that vaguely has reminders of cough syrup in its sweetness. From the hillside one can see the high tech farming facilities of the Israeli settlers on the other side of the road running along the bottom of the valley. 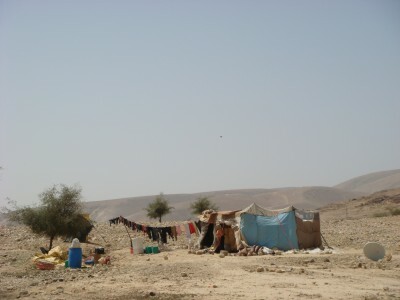 It is not hard to imagine why the land that the Bedouins live on is so desirable. There is money waiting to be made here. The village is surrounded by eight Zionist settlements, and at present 70 percent of the land has been confiscated for Israeli interests. Water is also being stolen to satisfy the water guzzling modern farms of the settlers. The stream in the valley next to the home of the Bedouins has been systematically drained over the last 50 years and is now only a dried out riverbed. “The Israelis have stolen our land, our homes, our water. They are killing us, and still they are not satisfied,” an older man among the Bedouins cried out. “They have no respect for us, ” he said. Back at the Tubas municipality center, Marwan E. Tubas finished up his presentation of the situation in Tubas on a lighter note. We firmly believe in coming to a peaceful two state solution with Israel according to the agreements of 1967… [Israel] supposedly supports Arabic people struggling for freedom in Lybia and Syria, but when it comes to the Israeli occupation no one dares to speak out.